We would like to introduce you to the beautiful countryside and the charm of Crete and so, we try to avoid the tourist centers as much as possible. We have reserved hotels with a double room with a shower and a toilet, and breakfast is also included. Depending on the time of your arrival you have today the opportunity to explore the city. 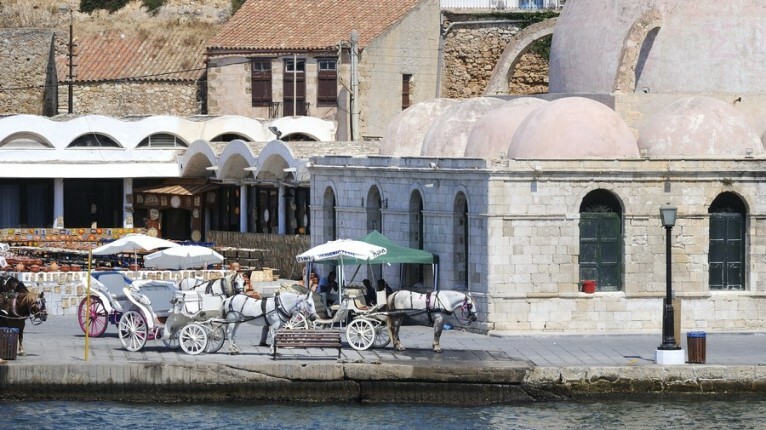 There is the Archaeological Museum, the port with the Venetian lighthouse and the covered market. You will stay in Chania town or nearby. From Chania town you follow the coastal road to the west. The route goes along the coastal towns with great beaches. At the end of the coastal road is the port of Kastelli, once the port of the ancient city Polirrinia, which is situated seven kilometers inland. At the tip of western Crete Gramvousa lies, with two islands off the coast. One of them is home to an old fort. At the beginning of this headland lies Falassarna with ancient sites and a beautiful beach. Inland you will also find the gorge of Topolia starting from the homonymous village. The rock walls of the lush canyon, which is 1,500 meters long, in some places reach a height of 300 meters. For today there is a long ride scheduled for you. We want to get you as soon as possible away from the bustle of Eastern Crete, so that you can enjoy the authentic atmosphere of the rest of the island. 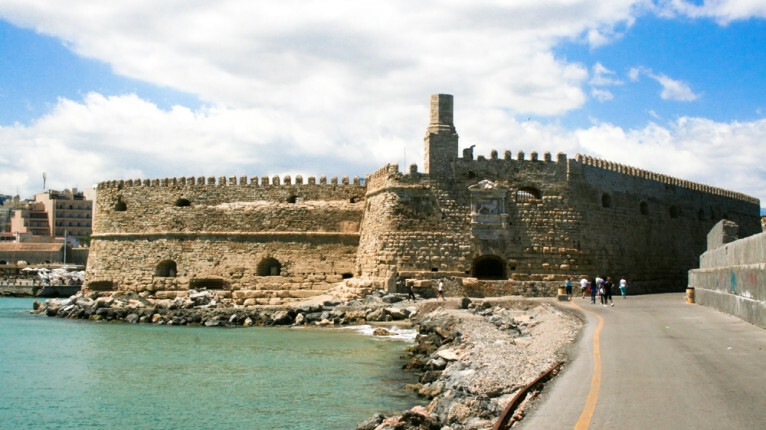 You drive towards Rethymnon via Lake Kournas, Heraklion with Knossos, Agios Nikolaos and Sitia. On the way from Heraklion towards Sitia, you cannot ignore the busier areas of Crete: Gouves, Hersonissos, Stalis and Agios Nikolaos. You can see it from the big, modern hotels, the many café-restaurants and as soon as the temperature allows, the overcrowded beaches. You can also notice the way that the rugged nature has framed these beaches. You leave Agios Nikolaos for now and will later have the opportunity to visit here. After Agios Nikolaos drive along the Gulf of Mirabello towards Sitia. You come along pretty coastal villages such as Pachia Ammos (= thick sand), with a beautiful beach and a crystal clear sea and the valley of Kavousi with many olive trees. The landscape around Sitia is not as rough as elsewhere in Crete. The surrounding mountains do not exceed 800 meters and the area is green and fertile. Beyond Sitia, the road to Palekastro is narrower and runs along beautiful, mostly deserted beaches. You will stay in Palekastro for the night. A total distance of 297 kilometers. 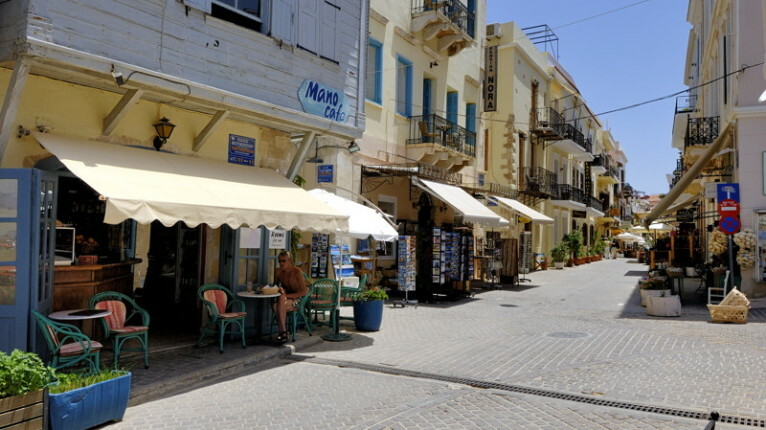 Palekastro, located in the easternmost corner of Crete, is a friendly village. In the immediate vicinity of the village you will find several beaches, a sandy area and a natural harbor. From here you can look out on the islet Grandes. From Palekastro you can go to the famous palm beach of Vai, six kilometers north. The historic Toplou Monastery is eight kilometers north-west of Palekastro. 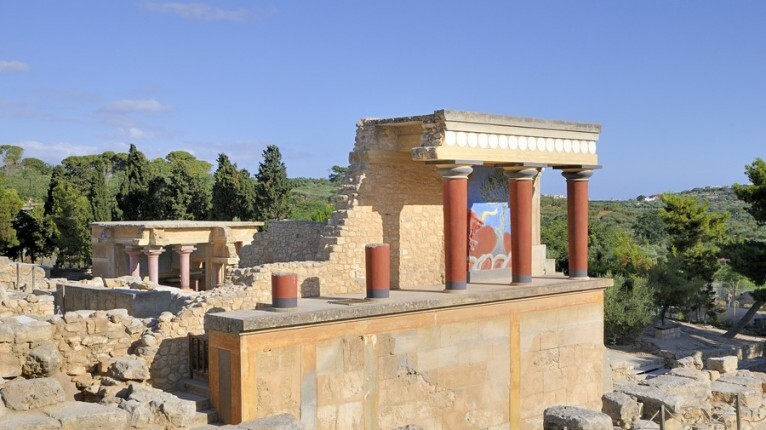 Moreover, the area is rich in ancient ruins from the Minoan period. In the bay of Ano Zakros there are also ruins of the Minoan civilization. You spend the night in Palekastro. The road that leads south from Sitia, Palekastro and leads to Ierapetra, runs along the areas of Piskokefalo, Episkopi and Lithines. Especially the latter is a picturesque village situated on a hill, completely surrounded by olive groves. Then to Makrigialos, Analipsi and from there to Mirtos while you will pass the beautiful beach of Agia Fotia. Ierapetra is the southernmost city of Greece. The climate is favorable all year round and so it has become one of the largest garden centers for fruit and vegetables in Greece. You spend the night in Mirtos. A total distance of 85 kilometers. Mirtos is sixteen kilometers west of Ierapetra on the banks of the river Krios. It is a quiet fishing village which also has a fine sandy beach. Directly behind the village rises the Dikti Mountains with a magnificent natural scenery. If you find the time to take a walk , you will be rewarded with the sight of an abundance of wild flowers and plants and the enchanting views from the quiet mountain villages. From Mirtos you can make more trips. The area of Agios Nikolaos that you already drove by. The distance from Mirtos is fifty kilometers. 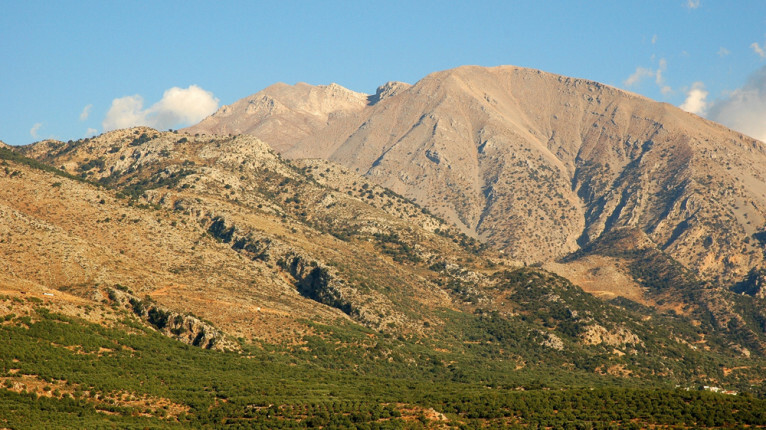 Approximately thirty-five kilometers west of Agios Nikolaos, at an altitude of 900 meters is the Lasithi plateau amid the Dikti Mountains. It is the largest plateau of Crete and especially known for its fertile soil, lush vegetation, the beautiful flowers and the many windmills. 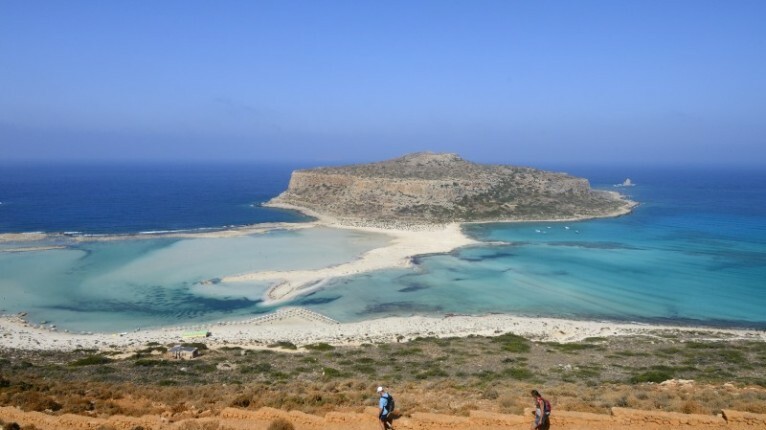 From Mirtos you can make a day trip by boat to the island of Chrissi. It is located about fifteen kilometers off the coast in the Libyan Sea. It is the southernmost, European island. It is uninhabited but picturesque and beautiful, dotted with green cedar forests and golden beaches which form a striking contrast with the turquoise water. You spend the night in Mirtos. West of Myrtos lies Ano Vianos, built in traditional style against the jagged mountain range. The village overlooks a plain filled with olive trees. On the square stands an ancient plane tree. From Ano Vianos you can reach the beautiful and quiet beaches of Arvi and Keratokambos. Then you drive through Pirgos and Aghii Deka towards Timbaki and Kokkinos Pirgos. You drive through the Messara Plain, the largest and most fertile plain of Crete and one of the most important agricultural areas of Greece. In Kokkinos Pirgos there is a fantastic sandy beach of twelve kilometers. In the east, about 100 meters above the Messara Plain and the Idi Mountains dominant in the background, is Faistos. A little further away Gortys. South of Festos is Matala, which became famous in the 60s by hippies who settled here in the caves along the beach. North of Festos there is a magnificent route along several traditional villages in the hills of Idi Mountains. Zaros Village is known for its abundance of spring water. Fishing enthusiasts can indulge in the trout living here. From Timbaki or Zaros go towards Agia Galini. You will stay in this bustling area. A total distance of 110 kilometers. Transfer to one of our vacation rentals for an extension. If you only want to make the car tour, please take the route from our brochure of western Crete. This ends in Chania city.